Nobel laureate in economics, Joseph E. Stiglitz, likens the euro to an inmate on death row who has just received another last-minute stay of execution. The markets are celebrating, but the euphoria will be short-lived as usual. The fundamental problems have yet to be addressed. 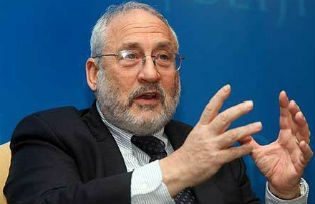 Joseph E. Stiglitz, a Nobel laureate in economics, has pioneered pathbreaking theories in the fields of economic information, taxation, development, trade, and technical change. As a policymaker, he served on and later chaired President Bill Clinton’s Council of Economic Advisers, and was Senior Vice President and Chief Economist of the World Bank. He is currently a professor at Columbia University, and has taught at Stanford, Yale, Princeton, and Oxford. He is the author of The Price of Inequality: How Today’s Divided Society Endangers our Future. NEW YORK – Like an inmate on death row, the euro has received another last-minute stay of execution. It will survive a little longer. The markets are celebrating, as they have after each of the four previous “euro crisis” summits – until they come to understand that the fundamental problems have yet to be addressed. There was good news in this summit: Europe’s leaders have finally understood that the bootstrap operation by which Europe lends money to the banks to save the sovereigns, and to the sovereigns to save the banks, will not work. Likewise, they now recognize that bailout loans that give the new lender seniority over other creditors worsen the position of private investors, who will simply demand even higher interest rates. It is deeply troubling that it took Europe’s leaders so long to see something so obvious (and evident more than a decade and half ago in the East Asia crisis). But what is missing from the agreement is even more significant than what is there. A year ago, European leaders acknowledged that Greece could not recover without growth, and that growth could not be achieved by austerity alone. Yet little was done. What is now proposed is recapitalization of the European Investment Bank, part of a growth package of some $150 billion. But politicians are good at repackaging, and, by some accounts, the new money is a small fraction of that amount, and even that will not get into the system immediately. In short: the remedies – far too little and too late – are based on a misdiagnosis of the problem and flawed economics. The hope is that markets will reward virtue, which is definedas austerity. But markets are more pragmatic: if, as is almost surely the case, austerity weakens economic growth, and thus undermines the capacity to service debt, interest rates will not fall. In fact, investment will decline – a vicious downward spiral on which Greece and Spain have already embarked. Germany seems surprised by this. Like medieval blood-letters, the country’s leaders refuse to see that the medicine does not work, and insist on more of it – until the patient finally dies. Eurobonds and a solidarity fund could promote growth and stabilize the interest rates faced by governments in crisis. Lower interest rates, for example, would free up money so that even countries with tight budget constraints could spend more on growth-enhancing investments. Matters are worse in the banking sector. Each country’s banking system is backed by its own government; if the government’s ability to support the banks erodes, so will confidence in the banks. Even well-managed banking systems would face problems in an economic downturn of Greek and Spanish magnitude; with the collapse of Spain’s real-estate bubble, its banks are even more at risk. In their enthusiasm for creating a “single market,” European leaders did not recognize that governments provide an implicit subsidy to their banking systems. It is confidence that if trouble arises the government will support the banks that gives confidence in the banks; and, when some governments are in a much stronger position than others, the implicit subsidy is larger for those countries. In the absence of a level playing field, why shouldn’t money flee the weaker countries, going to the financial institutions in the stronger? Indeed, it is remarkable that there has not been more capital flight. Europe’s leaders did not recognize this rising danger, which could easily be averted by a common guarantee, which would simultaneously correct the market distortion arising from the differential implicit subsidy. The euro was flawed from the outset, but it was clear that the consequences would become apparent only in a crisis. Politically and economically, it came with the best intentions. The single-market principle was supposed to promote the efficient allocation of capital and labor. But details matter. Tax competition means that capital may go not to where its social return is highest, but to where it can find the best deal. The implicit subsidy to banks means that German banks have an advantage over those of other countries. Workers may leave Ireland or Greece not because their productivity there is lower, but because, by leaving, they can escape the debt burden incurred by their parents. The European Central Bank’s mandate is to ensure price stability, but inflation is far from Europe’s most important macroeconomic problem today. Germany worries that, without strict supervision of banks and budgets, it will be left holding the bag for its more profligate neighbors. But that misses the key point: Spain, Ireland, and many other distressed countries ran budget surpluses before the crisis. The downturn caused the deficits, not the other way around. If these countries made a mistake, it was only that, like Germany today, they were overly credulous of markets, so they (like the United States and so many others) allowed an asset bubble to grow unchecked. If sound policies are implemented and better institutions established – which does not mean only more austerity and better supervision of banks, budgets, and deficits – and growth is restored, these countries will be able to meet their debt obligations, and there will be no need to call upon the guarantees. Moreover, Germany is on the hook in either case: if the euro or the economies on the periphery collapse, the costs to Germany will be high. Europe has great strengths. Its weaknesses today mainly reflect flawed policies and institutional arrangements. These can be changed, but only if their fundamental weaknesses are recognized – a task that is are far more important than structural reforms within the individual countries. While structural problems have weakened competitiveness and GDP growth in particular countries, they did not bring about the crisis, and addressing them will not resolve it. Europe’s temporizing approach to the crisis cannot work indefinitely. It is not just confidence in Europe’s periphery that is waning. The survival of the euro itself is being put in doubt.